After weeks of experimenting I got it right. Here is your fail-proof guide for Instant Pot Rice. Instant Pot white rice, Instant Pot brown rice, instant pot wild rice, and many more, basically an encyclopedia about cooking rice in an instant pot. This literally took weeks. Finding out about water absorption in the Instant Pot and the perfect rice texture. How to achieve different textures and most importantly how to reheat rice in the instant pot. If you’ve followed along for a while, you know I’m a huuuuge fan of the Instant Pot. My Instant Pot Chicken and Rice recipe is not only a hit at my house but thousands of others now, too. YAY! Now it’s time to find out how long each individual kind of rice needs to cook. 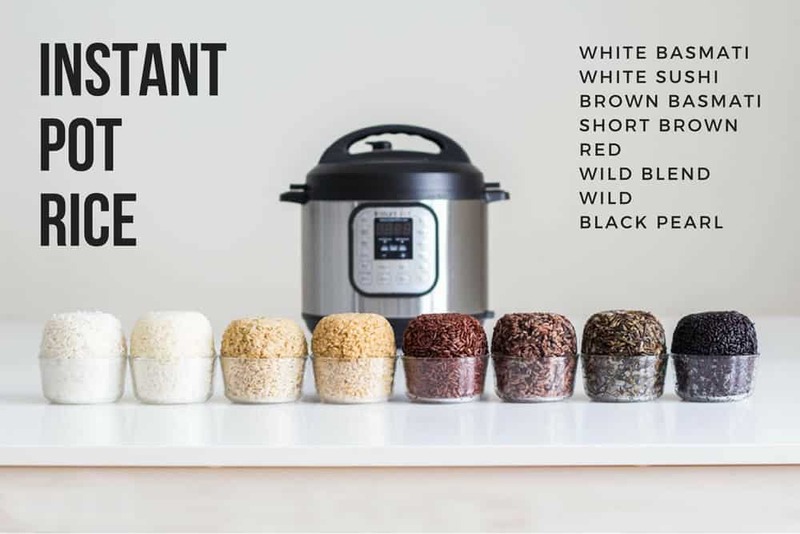 There is not only instant pot white rice, instant pot brown rice and instant pot wild rice, you know….. There is soooo many more…. What Is The Best Rice To Water Ratio For Instant Pot Rice? You’ll be surprised but it is always and for ALL sorts 1:1. Yes, you read that right. You wonder why on the stove different ratios are called for. Well, the darker or wilder the rice the longer it needs to cook and the longer something needs to cook, the more water evaporates during the process. This leads us to the conclusion, that different kinds of rice do not necessarily need different kinds of amounts of water to “cook” but rather more water to evaporate. Since the Instant Pot gives a tight seal and high pressure, no water evaporates at all. An example to make it easier to understand is “a new towel”. If you buy a new towel it kind of doesn’t dry you well, right? It doesn’t absorb water that well. The more you wash it and “process it” the better it becomes and faster it becomes at absorbing. That doesn’t mean it can’t absorb the same amount of water on day 1 and day 10. If you soak a new towel it’ll absorb just as much as a used one of the same kind but it’ll take longer to get the new towel soaking wet. When cooking Instant Pot Rice you’re basically cooking it as if in a sealed bag as shown in the video. What If My Instant Pot Rice Is Too Hard With a 1:1 Ratio? So, what if the rice is still crunchy and uncooked with the 1:1 ratio after pressure cooking. Doesn’t that mean it needs more water? Here comes a counter question for you. Is the rice super dry and stuck to the bottom and burnt? Or is it nice and wet when you just open the lid? I bet it’s still wet and only after stirring it and releasing all its steam it’s not super wet anymore. This means, there was still water in there the rice “could have” absorbed. If your rice is uncooked that doesn’t mean next time it needs more water, that means, next time it needs more TIME. Does 1:1 Apply For 1 Cup Just As It Does For 4 Cups? YES! When making Instant Pot Rice you need 1 cup of water for every cup of rice, regardless of if you cook just 1 cup or 4 cups. This is different when you cook rice on the stovetop where evaporation happens. The more rice you cook the less water you need when using a regular pot. Because the same evaporation happens with 1 cup as with 4 cups, so you don’t need to account for evaporation for each individual cup of rice but rather a “batch” of rice. What’s better? Hands down, no doubt >> natural pressure release. If you cook rice longer so you can do quick pressure release, with the hope to have the rice cooked faster overall, it gets sticky and mushy. It kind of overcooks and, argh I don’t even know how to explain but I guess I’ve just got to say: I don’t like it that way. I encourage you to be patient and wait for natural pressure release. I timed all rices and there doesn’t seem to be any rhyme or reason to the timing. Even the same kind of rice in the same amount has had different natural pressure release times. 18 minutes has been the absolute max it ever took in my case. 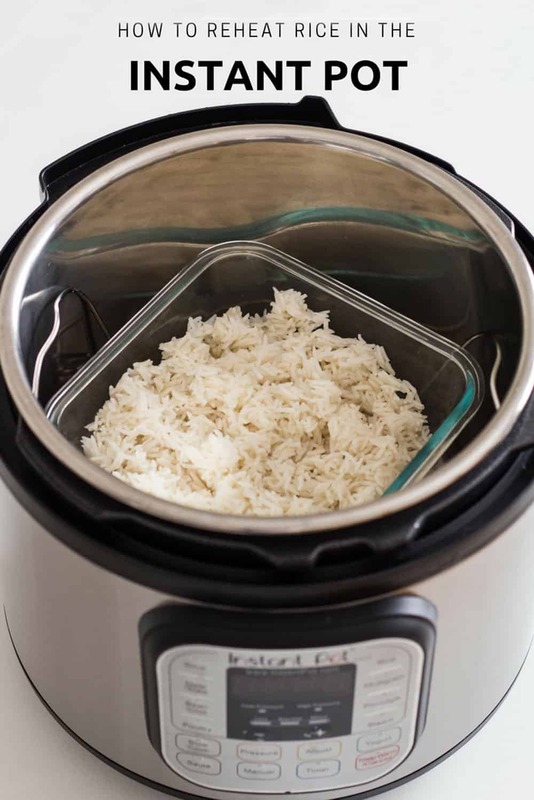 So to time for your Instant Pot Rice to be ready with whatever else you are making you have to account for 6-10 minutes getting to high pressure + high pressure cooking time + max 18 minutes natural pressure release. I’ve tried both Basmati and Jasmin and both cook in the exact same time. I’ve experimented with Basmati brown rice and with short grain brown rice and the Basmati cooked faster than the short grain. From all my experiments it seems like the thicker the individual grains, the longer they need. With exception of wild rice, that one needs long regardless of being a skinny dude. I was actually pretty sure this would take just as long as regular white rice but surprise surprise. It’s not as sticky if you cook it or only 3 minutes and this is the only rice you really want to be sticky, right? So increasing the cooking time actually made it stickier and better to work with for sushi. Soooo, this one is the trickiest because it has several different kinds of rice that individually cook in different times. I found it cooks best in an in between time. The wild rice in the mix will be completely unburst but the brown rice won’t be all mushy. So, I’ve seen a couple people recommend adding water or oil and stir it in the inner pot and pretty much making a mess, haha. Um, not my favorite method. I like thinks simple. I basically want the same convenience as a microwave but without the waves. I haven’t owned a microwave in 10 years and always used a pan and the stove to reheat things. When having leftovers though the amazing part is not having to cook, right? I not only want the benefit on not having to cook but also not having to do any dishes. I store my leftover rice in a heat-proof glass container and then place the trivet in the Instant Pot, add a cup of water and place the rice uncovered on the trivet. Put the lid on, knob to sealing and press steam for 5 minutes. Quick pressure release, done! Instant Pot Rice Better Than Stovetop Rice? I like Instant Pot Rice (and quinoa and farro, too by the way) soooo much better than stovetop. It’s probably the fact that it absorbs the exact amount of water it needs. Since we have to account for water evaporation on the stove it’s difficult to cook it to absolute perfection. Instant Pot Rice is the best rice EVER! So here you have it. The longest post in the history of Green Healthy Cooking. Ha! I hope you give one or more of these Instant Pot Rice “Recipes” a try and if you do, let me know how you liked them and how they turned out for you. Ever since getting my Instant Pot I haven’t cooked rice on the stovetop ever again. If you had to adjust timing please tell me in the comments below and also include information about altitude you live in, rice kind and brand you cooked and personal consistency preference so others in a similar situation as you can read your comment and adjust accordingly. Let’s make this post the Instant Pot Rice Encyclopedia, shall we? All of us together can make this the most complete post of all times by adding personal preference info and altitude info. Unfortunately, I lack the budget to travel around the world with my Instant Pot to test it all myself, lol. By the way, in case you were wondering, for the longest time there was a battle between Instant Pot white rice and instant pot brown rice in this house. We just couldn’t make up our mind which one we like better. Until we tried Instant Pot wild rice. NEW WINNER!!! Add all ingredients into the Instant Pot. You can double, triple or quadruple all ingredients in same amounts. Make sure sealing ring is placed properly in lid, add lid, turn shut and turn knob to sealing position. Cook on high pressure for amount of minutes instructed in the blog post above depending on type of rice. Natural Pressure Release until pin drops (max. 18 minutes). Remove all rice from pot immediately to stop from cooking. If needing to keep warm, leave rice in pot after natural pressure release without opening the lid so avoid steam being released and drying out the rice. I'm using a US standard cup. 236ml in volume. I do NOT rinse or wash my rice. It goes in the pot dry dry dry. You have to press “pressure cook”, make sure it’s on “high pressure” and follow the instructions of the recipe card, in terms of timing, see the cahart for the type of rice you have. Hi! It’s amazing that you read and respond to every comment! I have a question – I cooked “long grain” white rice tonight, 1:1 ratio, 3 minutes manual high pressure and 18 minute natural release. Came out a bit too hard for my liking. Would you increase the time? Also, why does the instant pot’s natural rice setting show 11 minutes on low? Should I try that? Hi Hal :) I try my best to respond to absolutely everybody. Yes, increase the time, that’s all. I’ve seen long grain white rice is thicker than basmati or jasmin. That’s why it takes longer. Try 4 minutes or even 5 minutes. Everything else stays the same. First time I tried your white basmatic rice in instant pot 3 mins high pressure. Came out absolutely amazing. Thank you ever so much. 28 minutes wasn’t enough for WILD RICE BLEND. I threw in a splash of water and it was fine after another 5 minutes on high. Hi Mark, it’s hard to give a timing for blends because different brands mix different amounts of grains and different grains overall. I used the Lundberg Wild Rice Blend. I want to make sure I have this right. I can put two cups of jasmine rice with two cups of water. Place it on manual high 3mins, release natural for 18 mins and it will come out perfect? I always just cook two batches I guess I’m afraid it wont be cook. Yes!! Absolutely! Depending on how thick the Jasmin rice grains are. I’ve had brands that are thicker than others and some take rather 4 minutes HP. I have the worst luck with rice in the IP. I’ve tried multiple instructions for different types of rice and always get “food burn”. I tried your instructions for short grain brown rice and about 10 minutes in – same thing. I rinsed the rice multiple times ’til clear, but didn’t soak it (last time I tried soaking as suggested elsewhere, it was a pile of ricey smoosh). Elevation is only 226 ft here. Any recommendations? Have you tried without rinsing? I never ever rinse my rice. I buy Lundberg Rice which is already washed and re-dried. Do you get the burn warning only with rice or also with other things? There definitely are some faulty Instant Pots out there. If you constantly get the burn warning with several recipes and you still have the warranty on it I would request a replacement. Turned out PERFECT!! I cooked 4 cups of wild rice and will freeze in 1 cup portions. Other recipes I have tried always has a ton of water left over. Hi! Really helpful info. Thank you! Have you tried cooking parboiled rice in the instapot? What would the measurements and settings be different from cooking white rice? Unfortunately, I’ve never seen parboiled rice before but someone else in the comments mentioned they tried 7 minutes HP and that worked. Everything else stays the same. 1:1 ratio and NPR. Wow. Thank you for this. So comprehensive and so valuable! Tuned out perfect. Long grain brown rice 1.1 in mini IP . I only made one serving. Will double next time. I have put 1.1 using long grain brown rice in a IP mini. Will this be enough to bring to pressure in this little pot? 1 cup rice and 1 cup water? Yes definitely enough. I cook 1 cup in my 6-quart even. We like (organic) long grain brown rice. I sauté onion & garlic, then sauté the rice, add the water, some saffron & cook for 24 minutes with an 18 minute release- sometimes longer if we get busy. So much better results than on the stove. Thank you for doing & sharing the trials & errors so we didn’t have to. Food is expensive! You are so very welcome Casey. Food definitely is too valuable to toss. I just made rice for the second time using your method and it came out perfectly! Jasmine rice – 3 minutes and natural release for 16. And thanks for the link to the video. So Informative. You are very welcome! I found it super informative, too. I’m so happy you found the guide useful. I’ve been cooking rice on the stove top for years and have become pretty successful at always getting it to come out the way I like it. I always fry my long grain rice in olive oil and minced garlic before boiling it. I have yet to try your method of cooking rice in the IP but I will be trying it soon. Perhaps I can still sauté the rice in the IP before I cook it under pressure. Yes!! You can absolutely do that. Works the exact same way. I click sauté, once the display says hot I add a little oil, the rice, and minced garlic and sauté for a couple of minutes, then add water, seal, and pressure cook. There is one important point to note. You have to place and seal the lid very fast as otherwise too much water evaporates due to the hot bottom of the pot. Since we’re adding 1:1 we have to ensure as little water evaporation as possible. That’s all. Hi – I came across your method of cooking IP rice to cook for my furkid with an upset tummy. I added chicken on top of the brown rice to cook along and they both came out perfectly. She gobled it up! Thanks for following up Lorena. I found the stove-top version of Lundberg Wild Blend to be chewy also. I’m glad you came back to let me know. Thank you. High altitude, 6500ft. Cooked 1.5/1.5 of Trader Joe’s jasmine white rice. 4 min at pressure with NPR. Good firm texture. If you like a softer texture I’d do 5 minutes at my altitude. Fantastic. Yes! 5 minutes should work fine. You have to account about 5% extra time for every 1,000 feet after 2,000 feet height. So 5% more time at 2K feet. 10% at 3K feet. 15% at 4K feet, etc. I tried your instructions for Lundberg Wild Rice Blend and the rice came out perfectly chewy. I did 2 cups rice (rinsed) + 2 cups water, 28 min, and natural pressure release (around 20 minutes) in my 6qt instantpot. Do you have instructions for cooking millet in the instantpot? I’m so happy you found the guide useful and were successful with my cooking times :) I have never cooked millet before and from what I read online there are basically two ways to cook it. More like rice and more like porridge. How do you usually cook it in a pot? I might be able to help you translate to Instant Pot cooking time once you tell me your favorite consistency and how you usually cook it in the Instant Pot. I cook Farro 1:1, 22 mins HP + full NPR for example. But I cook steel cut oats 1:2, 3 mins HP + full NPR for creamy oats. Cook on high pressure for 32 minutes with natural release. I’m going to try stove-top next. Maybe that’s just the way this rice is. Thank you for coming back and keeping me updated. Yes, please try on the stove-top as instructed on the packaging and let me know if you achieve any other results. Very curious. Andrew, 2 catmom commented further up that she cooked the same brand rice and she also describes it as chewy (but as perfectly chewy) so I assume, that’s simply the consistency of this kind of rice. I’m not an English native speaker so I’m always a bit lost when consistencies are described. This is the first time I’ve ever made perfect rice! I’ve been using a rice cooker for years but can never seem to get the rice-to-water ratio right – it always comes out mushy. The Instant Pot using these instructions made rice just like you would get at a Chinese restaurant. Thank you for doing all the research and testing! I cooked 2 cups of rice. I live at sea level. I’ll try 32 minutes with my next attempt. Hm, with the Instant Pot you used and at sea level, it should “in theory” have worked with the 28 minutes. Defo try 32 next time just in case. Please come back and report. I’m really bummed it didn’t work for you. I’ve found a foolproof way of cooking brown rice. Boil it. I don’t see any reason to use Instant Pot for rice since it does not save any time (in fact takes longer with time for it to heat up) and there is a high likelihood of failure judging from the comments. Dear Kristin, did you really read the comments? About 99.8% of people commenting were successful with my method. Why do you say there is is a high likelihood of failure judging from the comments? The reason I (and many other people) like cooking their rice in the Instant Pot is not time-saving. It’s the fact that one achieves the perfect texture “every time”, it requires 0 attention and frees up space on the stovetop. After waiting 30 more minutes, the pressure indicator still hadn’t fallen. I hit the steam release. There wasn’t much pressure left. It vented very quickly. The rice was firm… a little too firm. Should I try increasing the pressure cooking time and/ or water amount with my next try? Hi Andrew, how many cups did you cook and what size instant pot did you use? Also, at what altitude do you live? Did you cook at high pressure? (Some people accidentally cook at low pressure, that doesn’t work). You do not have to increase the amount of water you just have to increase the amount of time if ever rice isn’t cooked through. If you live at high altitude your rice will take longer to cook but the same amount of water. Maybe try 32 minutes next time. I tried the Lundberg Wild Blend Rice in my Insta Pot tonight and your directions worked perfectly. Thank you, thank you from Toronto, Ontario, Canada. That’s exactly the one I used for my experiments :) Huge fan of Lundberg! Thank you !! Been trying for a long time to get jasmine rice to not stick all together. This worked perfectly(though will cut back most of salt as I make and use for breakfast also). It seemed just the teenest chewy when i opened the lid and fluffed, but by the time I added my sweet fire chicken, it was perfect. very little stuck to pot. Thank you for all this wonderful info and answering questions promptly. I read through every post and comment and saw Arborio rice mentioned maybe 3 times? If I remember correctly, if I sauté it first (or not), then add equal parts liquid do I cook it about 7 minutes at HP, and let it natural release till the pin drops? Ok. I cook in my instapot at least 3x a week. I’d say semi-pro. But, I’ve cooked rice at least 10 times and it is always crunchy! This time. I did Your 1:1 and did 30 minutes with a full natural release and L14. Grrrr. We are in Chicago and I use Riceland extra long grain brown rice. Hey Debra, I’m a bit confused. What do you mean by L14? That’s what the display says? That’s simply the time of the natural pressure release. Once the Instant Pot beeps the L-Timer starts counting upwards. It’s not an error message. Was the rice cooked through or still crunchy? 30 minutes should REALLY be enough to cook rice. All your other recipes you cook throughout the week turn out great? I’m wondering if your Instant Pot is faulty? 30 minutes for brown rice should absolutely not leave you with crunchy rice. You did cook it on “HIGH” Pressure, right? I don’t understand the “high pressure” part of the cooking method. I’m new to the insta pot and I don’t have a button that says “high pressure”. I have: soup/broth, meat/stew, cake, egg, sauté, rice (which is what I used but it only cooked for 10 min), multigrain, porridge, steam, and slow cook) (also: adjust, delay, manual, keep warm). Let me know which buttons I should be pushing. Thanks! just use the manual button! You use the manual button and then you choose high or low pressure. For rice you use “high”. The problem with the “rice” button is it only works for white rice no other types of rice and in my opinion 3 mins on high + NPR gives better texture than the rice button. Hi – I have the same instantpot as julie – when I select manual I don’t get the option of high or low pressure, only to adjust the time. Should I just set in on manual? Hi Caroline, you use the “manual” button and then you can adjust pressure by pressing the orange “pressure” button to adjust to “high” if even necessary. Most Instant Pots are set to high pressure by default when pressing manual. I tried long grain white at 3 minutes with 1:1 ratio and it worked perfectly. Pressure on high with natural release. I do have this question: has anyone tried arborio rice, and if so, how long? (Sorry if it’s in the comments; there were too many to sort through.) Thanks! This is a great post but I’m still having trouble with my brown basmati rice. I really want to wash my rice so I drain it really well. I have the Instant Pot Mini, use 1 cup brown basmati rice, 1 cup water, 1/2 tsp salt, Pressure Cook button, high pressure, 22 minutes and then natural release. My rice is cooked okay but wet. Since I’m rinsing my rice, maybe I should decrease my water or should I increase my time. Three times and I still have wet rice! Hm. I would try with maybe 2 Tbsp less water + very important when you lift off the lid once it’s done make sure the condensation water doesn’t fall back into the pot. Try to lift and immediately turn it so the condensation water stays in the lid. Next time I make brown rice I will test with washed rice for you. I had to make a larger batch of rice than my little rice cooker could handle, so I thought I’d give the Instapot a try. I did the 1:1 with 3 cups jasmine rice and 3 cups water, but after reading some of the comments, I added another half cup of water. After adding the water, I did stir the rice around to make sure it was evenly spread out. I cooked for 3 minutes and did natural release for 19 minutes. Then released pressure (not much left) and fluffed the rice with a fork. PERFECT! It did not burn or even stick to the bottom of the pot. Definitely going to try this with the longer cooking brown rice. Thank you! I’m so happy it worked Melody and I really think 3:3 would still have worked perfectly well :) I do it all the time. I use Calrose brand white rice. For Koreans, we eat slightly sticky rice, but not sushi rice. I’ve used a combination of grains to make my husband brown rice and use 4 cups grain (mixture of white rice, brown rice, sweet brown rice, whole barley, pressed barley, quinoa, and mixed 7 grains), and I put in 5 cups water, 15min high pressure and 15min natural release and it turns out great. I’m worried about the 1:1 ratio for plain white rice but I’ll give it a try! Thank you for sharing your method. I’ve had a couple of people ask how to cook brown and white rice together. I thought it wouldn’t work. Clearly, it does. I have cooked Calrose rice for 1:1 for 6 minutes, natural pressure release and it turned out perfect. So I did 3min HP, 17NPR, and rice was not cooked enough… kinda hard, but sticky so I’ll up it to 4mins next time. I’m at sea level! Wow! Last night was the first time I cooked rice in the IP and it was perfect. Thank you so much! What about just plain old long grain white rice? Every kind of rice pictured above except the most common. What is the time and ratio then? NPR? Hi Tish, the “most common” depends on where you live. I think long grain white rice is a little thicker than basmati and jasmin, right? I would try 1:1 ratio, 4 minutes HP, and full NPR. I did the long grain white. 1/1 was a fail. 2/1 water/rice was great. It needed more water. I read it on the actual rice package. Definitely needed 4 minutes. Huh, I’m surprised, considering even wild rice needs 1:1 when the packaging calls for like 1:3. I would try 1:1 for 5 minutes maybe. Typically absolutely all types of rice just need 1:1 as long as there is no water evaporation, which there isn’t in the Instant Pot. What are your thoughts in quick cooking brown basmati rice? Thanks!! I have never cooked it before so unfortunately, I don’t know. What does the packaging say? Maybe we can figure it out depending on regular stove-top cooking instructions? After 3 minutes on high pressure, you left the rice in there for 1 minute before releasing pressure manually? Well, yes, of course, it wasn’t cooked. Also, how much rice did you cook? And did you use 1:1 ratio? Did you add 1 cup of water to the bottom of the instant pot, then the trivet, then the glass bowl, then the 1:1 rice and water ratio to your bowl? What about semi-polished rice? Seems the best kind since it packs more nutrients than white rice and much safer levels of arsenic than brown rice, but I can’t find any iPot cooking instructions for it anywhere. No problem, I’ve figured it out. It’s also known as hand-pounded rice, and the Jasmine/Thai variety will take 6-7 minutes normal or 11 minutes pot-in-pot (steel container). And yes, it seems to be a rare product. In my local grocery stores it only exists in the organic aisle, sometimes in the bulk food section, or packaged by one brand at a very limited stock. I found some online as well. Great! Thank you for the timing! It will be helpful for others with the same question. Any advice on altitude? Might be helpful if there was an altitude guesstimate at the beginning of the post. I hate cooking short grain brown rice on the stove top, looking forward to trying this out. It’s 5% for every 1,000 feet after 2,000 feet from what I’ve read but it isn’t something I can test because I live at sea level and for now I haven’t traveled with my Instant Pot. Others commenting have had great results with this formula however. I recently moved to Santa Fe, NM (about 7200′ elevation) and within days of arrival ran out to buy an Instant Pot because I don’t have to worry about air pressure with an automatic pressure cooker that controls its own pressure. I’m enjoying perfectly cooked rice without adjusting the times in this article. Thank you so much for taking the time to leave your experience. That’s so helpful to others who live at about the same altitude. That’s fantastic news!! THANK YOU for explaining why the RICE setting on the Instant Pot is just for White Rice. Thank you for doing all the work to come up with correct times – I printed the chart for future reference. Best wishes! i ditched my rice cooker but I am going to get a replacement after several okay to horrible results with using instapot. It works great for some things. not rice. nope – I have cooked rice 1000 ‘s of times and so I think I have plenty of experience to know how results should be and time involved. I’m so sad it didn’t work out for you John. What went wrong? Which type of rice did you cook and how? I was a little Leary about the 1:1 ratio and in my mind I just wanted to add more water. HOWEVER I stopped. I followed the directions provided making long white rice. It was AMAZING! It wasn’t sticky, it wasn’t mushy it was absolutely perfect. The natural release was taking forever, but I did instant at 21 min. Thank you for sharing. I’m so happy you trusted the recipe :) I looooove my rice in the instant pot and I never ever cook it any other way anymore. Hi. I’ve used your guide with success. What about reheating frozen rice? I’ve never tried in the instant pot because I’m scared to put my ice cold glass containers in there and risk the whole thing exploding. I’m not sure of course but I assume it’s very risky. I would not recommend it. I’m not sure what you mean. Do you mean putting aluminum foil in the pressure cooker? From an electrical standpoint of view yes, you can put foil in the pressure cooker. Nothing will happen. Aluminum foil is terrible for the environment and your health though. I never let aluminum foil touch my food. I was super excited when I found this page to cook rice in my instant pot. But…I tried making long grain white rice per the white rice cooking directions, and it came out very tough and the top layer wasn’t cooked. It wasn’t fluffy and light like I was hoping. I am not sure what I am doing wrong?? Does anyone have any suggestions? Is the grain of rice you are using very thick? (in circumference I mean). Much thicker than Jasmin or Basmati? I specified Basmati and Jasmin because there are several different types of white rice and Basmati is fairly thing and Jasmin even thinner. If your grain is thick I suggest adding an extra 2 minutes high-pressure cooking time. It takes 20 min to cook perfect rice in a pot on the stove!!! I dont understand this instant pot craze. Maybe for a pot roast or a whole chicken…but…rice? Yup! Not the right tool for this job. It is for me – it may not be for you and that’s fine. My pot lids have vents in them so an instapot that seals works best for me. There are quite a few types of rice that take 40-55 minutes to cook on the stovetop. You just need to open your horizons to better rice. If you are cooking rice that only takes 20 min or less, I can see why you would be skeptical. Using an Instant Pot does not sound worth it to you. There is a mixed long grain wiled rice we live that only takes 25 min on the stovetop (after boil) and I love it better in the Instant Pot. Plus, I don’t need to fuss with the rice while I work on other things. I have used these directions to perfection with short brown, long brown, jasmine, dark wild, mixed wild, mixed wild and quinoa. I am around sea level. I have used rice from many different companies. My Instant Pot is a godsend. So much versatility. As far as rice goes, perfection. Thanks for this post! Yeah, this did not work for me. I did a rice blend, followed the directions with 1 to 1 ratio and the time and it was dry and stuck to the bottom. I have cooked other recipes just fine. Hi Rachelle, what kind of rice blend was it? What kind of grains were in there? And how long did the NPR take? I love how people respond when you try to get to what caused the problem. Why post if you do not follow up? Lol, yup, the story of my life… It’s ok. Having all 5-star reviews would be unnatural, right? What about quick-cook brown rice? Half the time as regular brown rice? Sorry Melodie, I’ve never heard of quick-cook brown rice before. I haven’t tested this. It wouldn’t be worth it to cook minute rice in the instant pot. It would take way more time. Just cook it on the stovetop. I have been using the 1 to 1 ration with brown rice and it comes out the same, stuck to bottom, almost burnt and not cooked. What is going on? I tried your method, the manual’s method and also tried rinsing it. I just got the instant pot and ready to throw it out already. Luisa, have you made other recipes successfully in it? I am afraid your Instant Pot might be faulty. Did you keep the receipt? If I were you I would exchange it. My rice recipe is one of the most failproof recipes out there. If this doesn’t work for you I’m almost certain your Instant Pot is heating up too much. Oh yes, what Barb says. If you’re using an 8 quart the minimum liquid needed to get to pressure is 2 cups. So you’d have to cook at least 2 cups of rice with 2 cups of water. Do the pot in pot method. It never sticks! Has anyone tried this with Chicken Stock or broth instead of water? Does this impact cook time or quantity? I made it tonight with chicken stock in place of water. The 1 to 1 ration but to be honest I just pressed the rice button and let it do its thing and it came out excellent. Next time I will try this method to compare. Interesting and helpful guide. 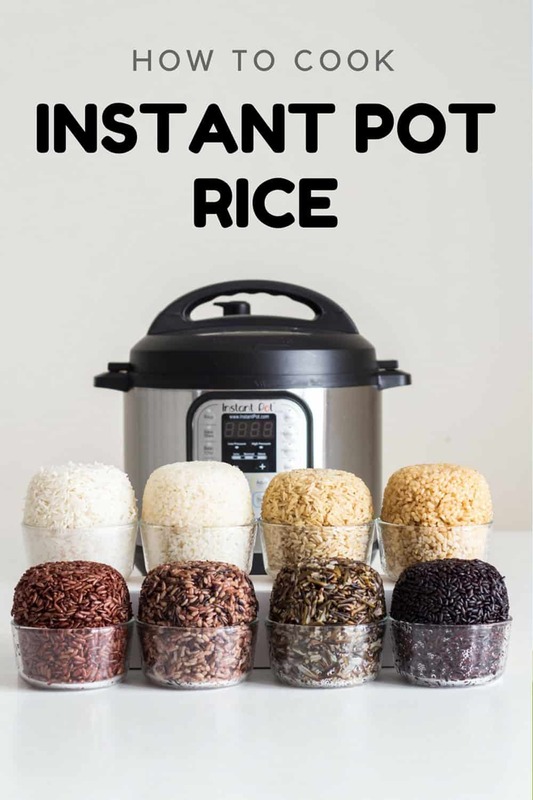 I like the idea of making this post, the Instant Pot Rice Encyclopedia and I hope you will revise the post as we all learn more through sharing so we’ll be able to cook perfect rice, every time, regardless of the type of rice. If you keep updating your post we won’t always have to scroll through all the comments. Haven’t read all the current comments yet but I will. One factor I think could make a difference in rice cooking is the age of the rice. A bag of the same kind of rice (e.g. a certain brand’s jasmine rice) could vary somewhat in age, i.e. how long has it been on the shelf in the supermarket and how long has it been in your pantry? The older the rice, the less moisture the grains will have and that could affect the cooking time and results. I know Steve Sando of Rancho Gordo makes this point with respect to beans. Beans from Rancho Gordo (which are fabulous, by the way) are going to be fresh because once a season’s supply of a given bean is gone, that’s it until the next growing season. Beans from a supermarket may or may not be so fresh as apparently they could have been sitting in a warehouse for several years. I don’t know if that’s the case with rice as old rice can become rancid, but it still can vary in age. Age definitely makes a difference in rice cooking. “Old rice” is rice that was harvested the year prior and will cook up more dry and not as tender. Also the best texture and fluff factor in rice comes from rinsing it thoroughly until the water runs clear. I wanted to share my good experience and the tweeks I made. I live in Denver, approximately 5,280 elevation. I had Yoga brand organic brown long grain rice. (There wasn’t a long grain brown cooking direction). I had a 2 lb bag and wanted to cook it all. Here is what I did. 1. Measured rice out, my 2 lb bag was 5 cups dry. I did rinse because with this brand, there is dirt in the final product if you don’t. Please rinse your rice!! 2. Put rinse rice in inner pot. Add 5 1/4 cups of water. 3. Pressure cook on high pressure for 27 minutes, with keep warm feature on. 4. Natural release. It took 37 minutes after cooking was completed for the pressure pin to finally drop (it felt like forever, but was so worth it). I fluffed it with the rice paddle and it was perfect. Best non sticky fully cooked rice texture I’ve ever had! Please note it wasn’t burned or stuck to the bottom at this point. I forgot to turn the warm feature off at this point though, and about 40 minutes later the bottom grains were crusted to the bottom. 5. We enjoyed what we were hungry for for dinner. Then, I filled up 1 quart feeezer bags (made 3), squished and laid them flat, pushed our air and sealed. I then have 3 perfect family sized portions of cooked brown rice. I label and freeze these so I just have to defrost or simple microwave for 3-4 minutes and have perfect rice ready to go for future meals. Yum and thanks! This worked better than any other recipes I’ve tried. My family prefers white rice but I prefer the health benefits from brown. My kids and husband said they preferred this recipe over classic white they love. But my PSA: Please please rinse (not soak) your rice in the future. Fantastic!!!! Thank you so much for that thorough breakdown!! This will be so incredibly helpful for both people wanting to cook large batches and people living at altitude. Thank you!!! ?? Why would you cook white rice for 27 minutes? I suggest 3 minutes + natural pressure release for white rice. At 200, altitude shouldn’t play a role. Was it the rice blend that has quinoa in it? That’s why it’s mushy. Wild rice takes quite long but quinoa actually only takes 1 minute. Those blends are pretty tricky to get right because of the different grains. It’s weird that there was still water in there though. Make sure, that when you lift off the lid, you don’t let the water condensation drip back into the pot but rather put the lid all wet into the sink to dry there. No, no quinoa in that mix, but I’m sure you’re right about the different grains. The contrast between wild rice and brown rice it most likely what was the issue. Lundberg short grain brown rice (Costco). 35 minutes. Sea level. Just past crunchy. With or without olive oil and salt. Hi John, I’m very surpised with that timing, did you choose high pressure not low pressure? And did you let pressure release naturally vs manually? Thanks for all of your info on rice cooking in the instant pot! I used Rice Select brand Jasmati rice and followed the instructions for white rice. It was almost perfect but was very slightly underdone…a little crunchy right at the ends of each grain. What do you suggest for time? I live at sea level in Massachusetts, USA. I’ve always soaked my rice before cooking it to make it more digestible/break down the phytates. Any tips to cooking rice then when it has been soaked? how long do you usually cook it in a regular pot on the stove and what rice to water ratio when you soak it? And which kind of rice? What you recommend if i just wanted to cook a 1/2 cup of rice ? Hi Sam! I recommend the PiP-method (Pot in Pot). I was finally able to test that. Works perfect. Find a heat proof container (preferably thick ceramic or stainless steel or thick glass) that fits in your pot and add 1/2 cup rice and half cup water to it. Put 1 cup water in the bottom of your instant pot, then the trivet, then your small pot (no lid required) with rice on top of the trivet. Put on the lid and set on High Pressure for the time necessary depending on type of rice. White: 3 minutes, Brown Basmati: 22 minutes etc etc. Wait for Natural Pressure Release and done. :) Check out my Lentils and Rice Post here on my blog and watch the video. There I’m using the PiP-method so you can get a better idea of what I’m talking about. Do you have any suggestions for when cooking white rice WITH something else, like chicken burrito bowls? I find the rice is always overcooked when I make recipes that cook the rice along with other food. Any recommendations for parboiled? Thank you!!! Unfortunately, I don’t know Pia. I’ve never seen parboiled rice here in Montreal so I can’t test that kind of rice. I’m guessing that the only way you can tell if it is parboiled is if it says so on the package and it doesn’t always. Put 2 cups of hot water and rack in base of Instant Pot. Rinse rice in mesh strainer with hot tap water. Put rice, water, salt and butter in medium steel pot for PiP and place on rack in base. Seal and cook 7 minutes on high pressure, NPR for 15-16 minutes then release. Fluff. Yes, it must most likely have been parboiled. Otherwise, brown rice can’t be cooked that fast. Thanks for the feedback! If I am making 4 cups of white rice, do I need to increase the cooking time to 12 min? Hey Kim, no, no need to increase cooking time. 4 cups rice, 4 cups water, 3 minutes, Full NPR. Are you for real? Read! Hi Lu, they should be fine after 24 minutes HP + full natural pressure release. I haven’t tested but considering they are similar in thickness as short grain they should cook in the same time. I make Mexican style rice using 1 parts of white rice for 2 parts of liquid consisting of a blend of water, onion, fresh tomatoes and garlic. I first pan fry the rice with a bit of oil and then add the liquid. The rice I use is white long grain rice but it is not basmati. It takes 30 minutes to cook on the stove. How can I adjust the rice-liquid ratio to 1:1 when I add tomato to it? The water will be too thick. Do you have any suggestions? Have you made this kind of rice before? Hi Dora, I’ve made this kind of rice before but not in the instant pot. I’ve made green rice in the instant pot with cilantro and that worked perfectly. 1 cup rice, 1 cup water and the cilantro blended into the water. Tomato has more water though of course. Not sure how it would work. I thinking maybe 1 cup rice, 1 cup water and 1 tomato blended into the water? I would try that. And for 5 minutes on HP + full NPR. This is THE best IP rice blog I have ever read. It is very thorough and it worked perfect for me. After making great jasmine rice with water, I experimented and used veggie broth–still perfect. I was wondering what you thought about using full fat coconut milk with jasmine rice. The consistency is different than water, so I’m not air it would work the same. I read though many of the comments so my question wouldn’t be redundant, but there were too many because this blog is so great! Thank you!!! That’s so nice of you. I have never tried that. I do wonder if you would get the burn warning because of the consistency. You could try pot in pot maybe. Add 1 cup rice and 1 cup full-fat coconut milk to a small pot that can fit in the instant pot. Add 1 cups water to the inner pot, then the trivet and then the small pot with the rice and coconut milk. Put on the IP lid and then cook on high pressure for 3 minutes + full natural pressure release. Thank you so much for this post! I have it bookmarked for reference and rice comes out perfect every time. I’m in Europe on sea level. Brilliant! Thank you for your endeavors. I tried the wild rice blend and it was magnificent! Hi Sow, I do not recommend the rice button for any kind of rice with any method. I recommend you try my method. For pot in pot you simply add 2 cups water to your inner pot, then the trivet, then the pot you’ll cook your rice in, 1 cup rice, 1 cup water and then seal your pot and set to 3 minutes on high pressure and let pressure release naturally until the safety pin drops on it’s own (will probably take about 15 minutes). Thank you so much for your lovely comment Sandy!!! has anyone made Tru roots sprouted rice and quinoa blend from Costco.? more wondering about time then anything. I haven’t tried it because at our Costco in Canada they only sell the one with regular grain mix not sprouted but I just read online on the stove top it takes 15-20 minutes so I would try again 1:1 ratio and 5 minutes HP + full NPR. No guarantee here, as I haven’t tested but that’s what I would do. I’m confused about something. I’m planning on making a Turkey and Rice soup today. Several recipes I’ve seen on the web say to cook for ten minutes, yet your cooking time for short grain brown rice says 22 minutes. Even Instant Pot’s cheat sheet says 22 minutes. Is there something different when cooking in soup stock vs just making rice? Robert, I’d be very surprised if “brown rice” cooks in 10 minutes. Are you sure those recipes refer to brown rice? Not instant or any of those things? You mention basmati and jasmine but what about regular long grain white rice or a medium grain white rice? I just made rice in my daughter’s Instant Pot the other day and thought it came out very gummy. I will try doing the full natural release you talk about and see if it helps. Awesome!! Yes pleeeeease come back and let me know if you had to adjust at 4,600. I’d love to know. Great information. I am a new IP user and would like some clarification on the rice recipe below please. Does it mean that manually I would set it for 3 mins. at high pressure? 3 mins. doesn’t seem like a lot of time to cook rice. Thanks! The thing is, the pot takes about 5-ish minutes to get to pressure and then another 10-ish minutes to naturally release pressure so you’re rice is actually cooking much longer than the 3 minutes you set it to. You add rice and water, you press the “manual” button (or newer models changed the name of that button to “pressure cook”) you set it to high pressure 3 minutes and then you walk away for at least 15 minutes and you open the pot once the safety pin dropped all on it’s own without you doing anything to the pot. Thanks so much, can’t wait to try it. Sounds like easy peasy. I come back to this guide time and time again, tried so far with short grain brown rice and wild rice. Perfect results at sea level! Thanks for this post, now I just need to print out a little chart to keep in the kitchen. I saw you’re already aware from other comments, but it might be helpful to add to your post about doing pot-in-pot. If you don’t want to make a full cup of rice (or whatever the minimum liquid requirement is for your IP), it’s convenient to use the pot-in-pot method. I regularly make 1/3 cup of rice in a small metal pot that fits on top of the trivet in my IP and put 1 cup of water in the pot itself. Works like a charm, your times are perfect. Living alone I usually only make 1/4-1/3 cup of rice at a time with dinner. I also have a steamer basket so I’ll put the rice on, prep some veggies and place them in the steamer basket, and as soon as the rice is done I take it out in its little pot and swap the steamer basket in (I don’t bother adding more water to the IP) and within a couple minutes it comes back up to pressure! No need to clean the pot between and saves the heat-up time and I have perfect rice and veggies as side dishes while I pan sear some salmon on the stove. This is brilliant Adrian!! Yes, I’ve finally experimented with the PiP method and I love it!! Check out my Lentils and Rice post where I use the PiP method and cook rice and lentils at the same time. Works like a charm. I cooked brown rice (not sure the grain length b/c I have long thrown the bag away, but its probably short). It was undercooked. This was my first dish that I have cooked with my pressure cooker. I cooked it on high pressure for 24 minutes with a natural pressure release. I wonder if its b/c I live at around 4500-4600ft altitude. I read on another blog that for every 1000ft after 2000ft, you need to add 5% cooking time. So I guess maybe I needed to add 10% cooking time (which would be about 2-3 minutes. I will try that out next time. what altitude are you cooking at? Thanks! Yes, exactly Carlie. For every 1,000 5%. Please try with 27 minutes + full natural pressure release. So tried this again. I cooked for 28 minutes and then NPR. that time ended up being about 30-40 minutes because we weren’t ready to eat yet. But I think it turned out well. I did more than 1:1 ratio though. I think I did 2.5 cups of brown rice with about 3 cups of water. Have to say this didn’t work with wild rice- put it in for 30 minutes natural release and it was nowhere near done. Added a slight amount of water and set for 9 minutes more. Just checked after pressure relief and 10 minutes instead of 9 would work. Hi Dirk, I’m so sorry to hear it didn’t work for you. I’m really intrigued. I’ve tested this so many times. Have you tried white rice at 3 minutes and it was done? Or have you only tried wild rice with my method so far? Thank you for the thorough post! I couldn’t read thru all the comments but I’m sitting here wondering why you do not use the ‘rice’ setting. Is it much different? Is the cook time the same for 3 cups of rice vs 1 cup? So 3 mins for white rice regardless of how many cups? Hi Christine, yes, the time is the same for 3 cups as for 1 and in terms o natural pressure release, the more volume is in the pot, the longer it needs to release pressure. I would leave it along until the pin drops on its own. If it didn’t drop within 40 minutes though you can be sure it’s just stuck. I’m disabled and use my instant pot a lot. I’m in the mood for stir fry and will cook to eat for 2 days. If I brown chicken chunks lightly and add chicken and frozen veggies to the rice with some stir fry sauce can I do this and still cook 3 minutes for Jasmine rice and same amount of broth/water? Not worried about the veggies. I like them soft. Yes Jeannie, if you cut the chicken in chunks the 3 minutes will be enough. Just make sure you remove the chicken from the pot before adding the rice and broth/water and then place the chicken back on top and veggies, too. Chicken and veggies will cook without being submerged in water but the rice won’t. Make sure the rice is submerged. If you use the Instant Pot rice option button it defaults to 12 minutes and you can’t change it. Are you setting it manually not using the Rice button? Exactly. I use “Manual” (“Pressure Cook” in newer models). I have some pink rice. Have you tried that? Oh, no. I’ve never heard about pink rice. Sorry. THANK YOU for this! This was so needed. Quick question – I usually like to mix brown & white rice. I use short grain brown rice and jasmine white rice (1 cup each). Do you recommend just going with the 24 mins high pressure so the brown rice cooks fully? Will that overcook my white rice? Hi Ara, yes it will most likely overcook the white rice but there is no other option. The brown rice won’t cook through in less than 24 minutes. When you usually cook them on the stovetop you mix them together, too? Does that work? You can always make white rice first, then brown rice and then mix them both together. I’m sure the texture will be muuuuuch better. I buy quick ( not instant ) brown rice at Aldi’s. It cooks for the same time as white rice. That’s great info. Thank you for sharing Marie! What a helpful post. Thank you so much for sharing. I feel silly asking this but do you leave the “keep warm” feature on or off? Please don’t feel silly!! All questions are relevant. You’re not the only one who asked. I should have specified. I leave the keep warm on. I basically don’t touch the pot until the pin drops. After much struggling to get sushi-rice cooked to the correct consistency, your advice nailed it! I added *slightly* more water – 2.25 cups of water to 2-cups rice. Turned out light, fluffy, perfectly sticky, neither al-dente nor “mush” as I’ve had happen. Thank you so much for doing all the experimentation and write-up! You are very welcome!! :) I’m so happy you found it useful! Do you use a dry ingredients measuring cup for the rice and a liquid measuring cup for the water or do you use the dry measuring cup for both? Hi Marie, it doesn’t really matter as long as it’s the same volume. You can also use a coffee cup or a washed out yogurt container. You just have to use the same volume of rice as you do of water. So fill up your yogurt container twice with rice and twice with water. The standard measuring cups and the glass jugs with measuring lines are for the exact same volume. You can use either for both rice and water as they measure the same volume. Our Basmati is always sticky no matter what ratio or time we try? I think it is impossible to get grain-separated rice in the IP! Have you tried my method? Do you add the rice in dry (not washed as some people suggest) and then opened the post and immediately stirred and removed the rice? My Basmati is grain-separated every time. If I want to cook 4 cups of white rice should I adjust the cooking time to longer than 3 minutes? No Laura. The cooking time stays the same no matter if you cook 1 cup, or 8 cups. Lorena – have you tested higher cup numbers? This has worked perfectly for me with 1 -2 cups, but I had a major sticky rice event with 4 cups… (referring to basmati here). Just curious. Natural release time ups the cooking time presumably w/ higher volume… am I wrong? Has this been your experience? Hi Maddie, I’ve tried with up to 4 cups (never more) and have had the same results. I’ve actually had times where I cooked only 1 cup and then forgot about it and the natural pressure release had been finished an hour ago and the rice sitting there in the keep warm function and the rice was still perfect. You can definitely try and add less water though. How long did your pot take to NPR? I guess with 4 cups this COULD have an effect? I can’t tell though. I’m so sorry your rice was sticky :( This recipe has worked for pretty much everybody so far. So sad to hear about the first not so perfect result. It definitely took longer to NPR – ..30ish minutes I think! Still love it for 1-2 cups…just skittish to try 4 cups again. Maybe I wasnt exact enough with my water … hahaha… I will have to try again someday. So this recipe is amazing. It turned out perfect the first time! Not slimy, no extra liquid, just perfectly textured rice. I look forward to using this to meal prep. Thank you so much! Thank you so much Lorena, for putting this together! You are very scientific in your approach. I love it! I have a 6QT instant pot which is quite large for 1 cup of rice. I was thinking of using PiP to cook the rice, but that usually means you have to add a cup of water to the main pot before I put the smaller pot inside. Do you think I should also add a cup to the pot that will contain the rice as well? Or is that too much water that will be in the pot (though some of it will be steam)? Hey Sammy, I’ve never tried the PiP method BUT from a pure logic standpoint of view I would add a cup of water to the Instant Pot Pot, then the trivet, and then 1 cup rice to small pot + 1 cup water also to small pot and then place the pot uncovered onto the trivet. The water at the bottom I think is necessary to not get a burn warning of a too hot pot touching a dry hot surface and the cup of water in the small pot is for the rice to absorb it all. The steam created by the water in the bottom shouldn’t necessarily all land in the small pot. I would assume it mostly drizzles down again on the sides of the pot? I’m not 100% sure though. You could also cover the small pot with a loosely fitted sheet of aluminum foil to avoid condensation dripping into it? Again, I haven’t tried this method so I can’t guarantee it’ll work. I have however successfully cooked 1 cup of rice with my regular method described here in the post in a 6qt. My Instant Pot gets to pressure with that little volume just fine. I thought the same thing about a small amount. I cooked short brown rice and the time was PERFECT! Best white rice I’ve ever made. EVER. Thank you! Hello! Thanks so much for doing this page. I wanted to comment on what you said about not needing to rinse rice. I don’t know if you were also referring to brown rice, but I have been working with a brown rice farmer for years and washing isn’t one of the steps that is taken during processing. You are doing god’s work outchea. Thank you so much for doing this, so we don’t have to. Thank YOU for coming back and commenting. It means the world to me!! Do you rinse your rise before using? I just got some jade pearl rice, have you tried cooking that? When cooking the rice with frozen vegetables approximately how much water should i put in extra to cook everything with the rice? I am always sceptical of these types of “wonder shortcut” things, but you really did do your research–thank you for the guidelines and tips. I have never cooked rice in my pressure cooker because it was too hard (I thought). Today I cooked a huge pot of wild rice and put half in the freezer (on your recommendation, too). So thrilled to find someone who knows their stuff and is happy to share. Thanks! 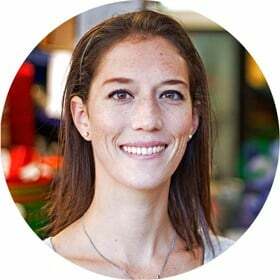 Wow – wonderful research and advice! I’m at 7,200 feet (in Santa Fe, NM), and just tried white sushi rice at 5 min high pressure (i.e., no adjustment for altitude). Came out great (16 min natural release). Although another minute of cooking (20% longer) might have yielded stickier rice, the rice I got was cooked through. Thank you so much for your healthy post! Wondering if you know how to make quinoa with born rice in Insta Pot? Ratio the dam was brown rice? I apologize. I was skeptical and didn’t believe this would work. I was wrong and I’m sorry for doubting you. I live at 8800 feet west of Denver. I figured I needed more water and a longer cooking time. I decided to follow your directions anyway. I rinsed 2 cups Brown Jasmine rice and added 2 cups water and 1/2 tsp salt. Cooked for 22 minutes. Set a timer for 15 minutes npr. Went outside to talk to a neighbor and came into the timer beeping. It was a 22 minute npr. Rice is perfect. Thank you so much for a new and fool proof method! This was a little confusing for me – did you cook on High pressure for the 3 minutes and the total time was 22 minutes? I did not know you could set a time for NPR. Hi Dianne, I’m sorry this was confusing. Yes, all pressure cooking times are for cooking with “HIGH PRESSURE” and no, you cannot set a time for Natural Pressure Release. It will always take a different time. NPR simply means you do NOTHING once the high pressure cooking time is over and wait for the safety pin to drop all on it’s own without touching the valve. It may take 10 minutes or it may take 20, that all depends on the size of your pot, the volume that’s inside and the altitude that you live in and the mood your pot is in that day ;) For white rice you click “manual” “high pressure” “x minutes as described” and then you walk away and only open the pot to perfectly cooked rice once the pin dropped. Let me know if you have any further questions. I’m assuming I can switch it the water for broth? Have you ever added but to the rice/water while it’s cooking? Yes, you can easily replace with broth. I’m not sure I understood your second question. You can’t add anything to the rice while it’s cooking because it’s under pressure and the lid is not removable. Meant to say: for 32 minutes in my Instant Pot (IP Duo). Thank you so much for sharing this. I successfully cooked wild rice in my new Instant Pot and am so excited about that! Following your suggestions I cooked two cups of wild rice in two cups of water for 32 in my (IP Duo). The rice came out exactly as I hoped it would. The natural release had not happened by 20 minutes so I just turned it off and took the lid off and it was perfect. Thanks again. Thank you for this!! Can you tell me if toasting the rice first on the sautee setting will have an effect on the time? I’m new to rice cooking. It doesn’t have an effect on the timing. I do that often. I add some oil, some crushed garlic, the rice and toast, then add water. The only thing you have to pay attention to is to preferably not add freezing cold water but rather room temp AND to be ready to put on the lid fast. Since the pot is already hot and the water isn’t there happens a lot more evaporation. To avoid that you have to be quick adding the lid and closing the valve. Thank you so much for this information. I just got my instant pot and have not used it yet, but we cook a lot of wild rice, and also packaged red beans and rice. My question is, would I used the same water to rice/beans ratio as for just rice? The package is 8 oz and calls for 4 cups water. Would you recommend the 1:1 ratio for this also. Thanks so much. Oh gosh, Charlotte, I’m sorry, I have no idea. I’ve never seen a package as you describe. I have a package of white rice and puy lentils which are super small and cook fast so for that I do the 1:1 and 3 minutes HP + NPR technique. Not sure if it’ll work with the red beans though. You’ll have to try to find out. Sorry I can’t be of more help. I don’t know if my instant pot is malfunctioning or if this is normal, but there is a solid 3 minutes between when the red button pops up and when the timer finally starts counting the time. Should I count the rice cooking time from when the button pops up, or use the programmed time, even though it’s already been at pressure for 3 minutes? Jana, do you mean from the moment you press manual and 3 minutes high pressure to when the counter starts counting? Because that would be normal. That’s the time the pressure cooker takes to come to pressure. It heats and pressure forms in the pot and eventually the safety pin jumps up and makes it impossible to open the lid. That’s when the pressure cook timer starts. That’s when the 3 minutes start. I suggest you add rice, water, sea salt, close the lid, turn the valve to sealing position, press manual, make sure it’s on high pressure (not low), set timer to 3 minutes and then walk away for 20 minutes. Like, completely walk out of the kitchen and then come back and check. Why doesn’t anybody talk about high altitude. They give times but that is for sea level. I live at 6000 feet. That affects everything we cook. Even when canning you can things for longer and higher pressure. I do talk about it in the blog post Mary :) Also, in a couple comments. From what I’ve read you have to add 5% cooking time per every 1,000 feet of altitude. I will never be able to confirm exact cooking times for anything but sea level and that’s where I do all experiments and cooking. I just got my IP and tried to cook jasmine rice according to your instructions. 2 cups rice (unwashed) + 2 cups water. 3 minutes high pressure and manual release. After 21 minutes the pressure valve still hadn’t come down. I had a starving toddler to feed So I did a quick release which let out only a little squirt of steam and the valve fell. The rice was only slightly undercooked. It wasn’t awful but it certainly wasn’t perfect. Any thoughts as to why it was taking so long? Hi Andree, at what altitude do you live? Was it “white” basmati rice? 21 minutes natural pressure release sounds about right for 2 cups. Pressure release takes longer the more volume is in the pot. Sometimes the safety pin gets stuck and all pressure is actually out. Usually after 25 minutes I turn the valve, too and if no pressure comes out I shake the lid a little and the pin drops. If you live at high altitude you might have to add another minute of high pressure cooking time for better rice. Hi thanks for the reply. For all intents and purposes I basically live at sea level. I was cooking white jasmine rice. But if it’s normal for more rice (ie. 2 cups) to take longer to manual pressure release that’s fair. I’m wondering too, if you have to step away from the rice and you won’t be around once the pressure is manually released, do you set it on the “keep warm” function? Or would that over cook the rice? Thanks. I put in the rice, the water, some sea salt, close the lid, turn valve to sealing and set it to 3 minutes high pressure (important, not low pressure) and then I literally walk away so yes, the keep warm function turn on automatically once the 3 minutes are over and I don’t mess with anything until the pin drops by itself. If after say 25-30 minutes the pin still hasn’t dropped I turn the valve and check if any pressure is still in. If there is I immediately turn it back to sealed. If there is non I know the pin simply got stuck, I shake the lid a little, it drops and I open. Thank you for all the information! I greatly appreciate it! Lorena, do you have the “Keep Warm” option on or off during the Natural Release? Yes Linda, I leave it on but it works both ways, on and off. Appreciate the work that went into sleuthing this info out. This could be a great resource were it not lacking information for presoaked rice. Some of us IP users even still soak our beans. I soak beans, too but not rice. I go into detail about why in several other comments. I have been on the hunt for a rice cooker to replace my old one. Discovered it may be toxic. I also discovered it’s better to soak brown and black rice for health reasons. Looking for presoaked rice cooking instructions for the Instant Pot. Considering getting a 3 quart Instant pot for rice and grains. I let it sit on the counter for a while with the bowl’s cover to see if the residual heat would help to cook it, but to no avail. Any thoughts on what went wrong here? I believe you are suppose to cook the rice in the instapot alone, as in the only things in the pot are the rice & water. Placing the rice in a bowl is done after the rice has already been cooked and you are simply reheating it. Um, Jennifer, I’m so sorry you must have misunderstood. You don’t cook the rice in any recipient standing on any trivet. You cook it right in the pot. That’s why it was hard. The picture of the rice in the pyrex on the trivet is of COOKED rice being REHEATED. I never thought this could be misunderstood. I am so so sorry about that. Please give this recipe another try. Add the unrinsed rice directly in the instant pot’s stainless steel pot insert, then water, a little salt if you want, lid on, sealing valve on sealed. 3 minutes high pressure, NPR and you’ll have perfect rice. If you have leftovers store them in a glass pyrex and if you want to reheat the leftover rice use the method of putting on a trivet and adding water to the pot, not the pyrex. Please let me know if you have any more questions. Again, I’m so sorry there was this misunderstanding. You’re the BEST for doing this…hope you have PC/IP recipes still coming!!! Thank you :D And yes of course!!! Working on a series of salads over the summer but end of August back to pressure cooker recipes. One quick question…I’m holding long grain brown rice in my hand. Looked through your list but must be missing it. Should I treat it as a brown baslmati when cooking? Thank you for the time that that you dedicated to figuring out the water ratio and timings for lots of different rice. I was wary to use my instant pot as a rice cooker but after cooking my first batch I’m sold. I may have to retire my rice cooker. I made short grain brown rice. I live in Osaka, Japan btw. I’m so happy you found it useful Laura!!! You have to go off of the grain in the mix that takes the longest to cook. Since it’s got wild rice I would defo cook for at least 22 minutes or it won’t be cooked through. The white might be overcooked but still edible. I made jasmine rice. 2 cp rice, 2 cp water. High pressure 3 minutes. Natural vent 20 minutes. It’s hard. Not totally cooked. I’m in Michigan. I have a 6 qt instant pot. Not sure what went wrong. Thanks. I take that back. It sat for an hour before dinner. It was absolutely perfect. No mushy rice. Thank you so very much!!!!! Hm, Michigan isn’t high enough to make that a factor. Are you sure it was on high pressure? Did the pot seal well and did the safety pin jump up after only a couple of minutes? I’m not entirely sure what else it could have been. So sorry it didn’t work for you the first time. So are you manually entering in 3 minute cook time and not using the “rice” button? I just bought an instant pot yesterday. Hi Sarah, the only buttons I use are basically “manual” or “pressure cook” depending on the model (it’s the same button), pressure level to set high pressure or low pressure and the plus and minus buttons to set time. I don’t use any of the other buttons. I prefer to experiment and get to the perect consistency of each ingredient that way. Instapot and Rice – a site dedicated to this?! Thank you for all your kitchen experiments! I am so happy I found your site. I used my IP to make rice for the first time, arborio rice. I live in the Mile High City, Denver Colorado. 5,280 feet above sea level. Using your instructions it turned turned out awesome! Thank you!!!!!!! This was my first time making rice in the Instant Pot and my short grain brown rice came out perfectly!! I was nervous after reading so many different recipes and methods, I didn’t want to ruin all that rice and I didn’t want to have to start over so close to dinner time. Thank you so much! Hi Nadine, if the stove top directions say 15 minutes it’s basically cooked like any white rice. It surprises me because of the wild rice in it but I’d try maybe 5 minutes high pressure plus full NPR and still 1:1 water to grain mix ratio. Have you tried with sticky rice? Is it the same ratio of water? I would assume sticky rice is similar as sushi rice? I cooked Lundberg’s Sushi Rice with 1:1 ratio and it was very sticky. Hi, what about parboiled rice? Parboiled Golden Basmati Rice is a pre-steamed variant of pure raw Indian Basmati Rice. Pure Basmati Paddy Rice is soaked, pressure steamed and dried to produce Taj King Golden Parboiled (Sella) Basmati Rice. I’m sorry, I’ve never tried. Thank you! This was the best site on all things Instapot rice. Very informative and accurate. The rice was perfect! This is so far the BEST post on all kinds of rice and how to cook them. Love the details and the photos are beautiful!! Thank you so so much for your wonderful comment Archana!! before cooking it Have you ever been in a Rice Mill? Great advice!! Perfect rice every time. My only complaint is that I cannot find this post when I search my pins. It does not come up under rice, instant pot rice or instant pot. Please make this searchable. Hi Ann, I’m surprised to hear it doesn’t show up in your Pinterest. It shows up in mine. I do everything (believe me, EVERYTHING) on my side to make my recipes searchable but in the end social media decides on its own what they want to show to whom and what not. It’s the most frustrating thing in the world. I’m currently # 2 (sometimes #3) on google so you should easily find it when you google “Instant Pot Rice”. Well I just made my first batch of rice using your directions and we are now best friends. (In my mind) ! Lol. Thank you so much. This has given me so much confidence and access to too much food. Ha. Hello, I found your post fascinating. I have the Ultra IP with the rice setting. I’ve made white rice, brown rice and tonight wild rice all using the rice setting. Each came out perfect. I love the IP so much I donated my rice cooker. My question to you is have you ever made steel cut oats in the IP? I hadn’t thought about using it to cook my oats until you mentioned quinoa and farro. Thank you so much for such great information! I’ve been referring to this post whenever I have to cook different kinds of rice. We live in the Philippines where it’s pretty easy to find locally grown red rice. My husband and I find the flavor too strong and we have been mixing it with white rice and cooking on the stovetop. Any suggestions on cooking white and red rice together in the IP? Based on your wild rice blend experiment, should I just find a happy medium time where the red rice is just about to burst? Thank you again! Thank you so much Danielle!! Re mixing red with white rice. Hm. That’s a really tricky question because my wild rice blend was all grains that by default take longer to cook. No white rice mixed in because it cooks so fast. You could try at about 24-ish minutes but honestly I think you’ll have a lot better results cooking one rice first, then remove and store in a large ovenproof container (that would still fit in the IP, cover and place in the fridge, then cook the other rice. When the second batch is finished, add to the first batch and mix and then place the container in the IP to reheat both batches as instructed in the post. I think that way you’ll get the very best results. Hi Caroline, you add 1 cup to the stainless steel pot under the trivet so to speak and place your glass container on the trivet so the water never touches the rice or the glass container really. 1 cup of water regardless of how much rice. Or 2 cups if you have a bigger instant pot (I believe the 8qt needs 2 cups), the water is basically just needed so the steam gets the pot to pressure which is what will reheat the rice. Lorena, this Linda again at 5,500 feet. I am sorry, but I posted twice–I didn’t think the first one went through. I do have a follow-up question, though, to your much appreciated response. Do you think organic rice might cook differently than non-organic? Hi Linda, no it shouldn’t make a difference if it’s organic or not. The only thing that affects cooking time is altitude and thickness of the individual grain. Lorena, I live at 5,500 feet altitude and am having trouble cooking organic brown basmati rice. Regardless of the recipe, the rice is undercooked and there is residual water in the Instant Pot when I remove the lid. I have even tried cooking it 30 minutes with a 10-minute natural release. I am anxious to try the ratio you recommend for water to rice. What should the HP time be for my altitude? What should the natural release time be? Thank you. Thanks so much for doing this. You mentioned trying Arborio rice. Have you had a chance to do that yet? I’ve been experimenting and getting ok results but nothing to write home about. I’ve done 1 cup arborio to 3 cups broth 10 minutes high pressure + full natural pressure release. I’ll have to continue experimenting until I find the BEST settings. I live at 5,500 feet altitude. When cooking brown basmati rice in an IP, what times would you recommend for HP and for NPR? I am anxious to try your recipe. I have tried several recipes and the rice is always crunchy with water sitting in the pot. So frustrating! Hi Linda, from what I’ve read you have to add 5% cooking time per every 1,000 feet of altitude. So at 5,500 feet you would have to pressure cook brown rice for at least 28 minutes at high pressure. The water rice ratio remains the same because there is no water evaporation in a pressure cooker regardless of altitude. The natural pressure release remains the same, too. Leave the vent untouched and let the pressure release naturally until the pin drops on its own. Let me know how it went. If the rice is still cunrchy, increase time by 2 minutes. Don’t add more water. I just bought an instant pot and you are my new favorite person! I just made perfect chicken breasts for several casseroles and am making rice now! Thank you! Thanks for the reference guide! Just got my Instant Pot and I’ve had bad luck with rice so far, so now that I’ve read your guide I’m eager to try again. Apologies if this was asked elsewhere…when adding things to spice up your rice (like salsa, lime, chicken stock, or whatever) do you displace the amount of water you’d normally put in or do you just add it on top of the water? Do you keep the instant pot on warm mode during the NP release or turn it off? Yes, I keep it on warm mode. Simple question with an answer I may have overlooked… When cooking manual with the IP it automatically goes into “Keep Warm” after. Do you turn that off or allow to remain on during the natural pressure relief? I just made white rice with this method and wondered the same thing. I decided to turn it off and it turned out perfectly! Great info and recipe! My mom taught me to cook rice on a stove top almost 40 years ago and it is foolproof… I jut recently got my Instant Pot and wanted to try making rice. I modified the recipe a bit to blend a bit of old and new. First, I never rinse my rice. Third, I use a really good chicken stock instead of water. I followed your method for white rice, but added ghee (a rounded teaspoon per cup) ahead of time on saute. once the butter was melted and sizzling a bit, I stirred in the rice till every grain is coated. You can use olive oil, butter, or a combination of olive oil and butter, instead of ghee. When everything was combined, I poured in the chicken stock. After that, I followed your method and the rice came out perfect. I cook it exactly the way you cook it but in addition I add garlic with the rice when frying it before adding stock :) The blog post is only for timing and liquid to rice measures so people know how to achieve fully cooked rice with great consistency. All the extras are to make rice fancy and I agree 100% rice that’s been fried a couple minutes before cooking tastes amazing!! I am a junior cook, and I have a simple question. Do you sauté the rice in ghee using instant pot? Does it mean you are using instant pot without putting the lid on? 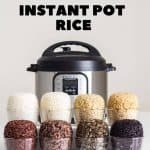 I’ve cooked a lot of rice of all kinds for years, stove top and now in my Instant Pot, and your method really intrigued me! I’ve been messing with various amounts of water and cooking times for brown and wild rice, and mixed rice. Your explanation of why there is no need to vary the amount of water when using the PC was so logical I had to try it, and it works so well, no more mushy or watery brown /wild rice! I live at about 5000 ft, and I generally use the P in P for rice, using a heavy Pyrex bowl with about 1 1/2 C of water in the bottom of the PC and the bowl on the trivet of my 8 qt IP. I like mine pretty well done, not crunchy, and both the straight short grain brown rice and the brown and wild rice mix from Bob’s Red Mill come out perfect for me at 40 minutes, whether I’ve made 1, 1 1/2, or 2C rice 1:1 with water. Thanks a while bunch!! Wyn, I’m soooo happy you found my post useful. Comments like your fill my heart with joy! Thank you for taking the time to come back and leaving such a wonderful and thorough review. I really appreciate it. Great information!! Made 3 cups of white rice and it came out perfect!! Yeeeeey!!! I’m so happy you found this guide helpful!! Okay so silly question… If I want to cook 2 cups of rice does the cook time stay the same? Yes Laura, the cook time stays the same. When cooking ride in stainless steal stackable containers, do you add the liquid in with the rice or just put in underneath in the instant pot insert and use the steam lid on the container? Hi Ricki, I’ve never used the pot in pot method but others tell me they add 1:1 into pot plus 1 cup into instant pot itself. I’m so happy you found it Lisa!!! Yes, pinning is always the best idea to save your favorite recipes and tutorials in one place. Thank you! I have been so frustrated with rice in the pressure cooker. It would never turn out the same. It must have been the instant release verses natural release. Depending on if there main dish was ready or not. I am so excited to do it your proven way. Thank you! This was very helpful! I did 2 cups of brown Basmati with 2 cups beef stock plus 1 tsp of Penzeys Greek Seasoning blend plus 2 tsp of Avocado Oil. 25 minutes with NR of 20 minutes or so. (I got impatient and “poked” it at the end). lol. Taking off the lid, there was about a tbsp of water “collected” on the lid. The rice was tender with a bit of chew; would be very good for rice salads where you need to add other wet ingredients like a salad dressing. If I need softer rice, I’d likely add a couple of minutes for the volume. Awesome Melissa!! Thank you for your thorough review!! This will help SO many people living on higher altitudes. Thank you, thank you, thank you! I just found this and I am so super excited I can’t even breathe! Thank you so much. You are very welcome Shannon. I’m so happy it’s useful for you!! That awesome guide cover everything! (Well except 1 thing). I keep this page and will follow it for all my rice. Do you know best pudding rice (short grain rice) with milk ratio? And cooking time? For rice pudding. Hi Jay, thank you for your comment and rating. Unfortunately, I don’t know I don’t dare trying. Milk usually scorches to the bottom in the Instant Pot. I could imagine it works if you cook the rice with water like sushi rice and then add milk after it’s cooked? Shouldn’t do. Old fashioned stove top pressure cooker my grandma and dad used do use milk and rice and sugar and never problem. Most include sugar and some don’t and American seem add eggs at end some reason. As far I know UK rice pudding don’t add eggs (they might do but not ones I seen). I also found this rice pudding recipe. I’m eager to try it, but haven’t yet. Oh gosh, I’m sorry Tomomi, I’m not that versed in rice terminology. I used Lundberg’s “Sushi Rice”. It’s a blue bag and it just says “Sushi Rice”. This page has been bookmarked! Thank you so much. I only eat brown rice, and most recipes give the time for white rice, so I’ve been “guessing”. There was no guess work for this and my rice was perfect! Thank you again! I’m curious why your chart didn’t include Jasmine white rice. Are the cooking instructions the same as Basmati white rice? Thanks. Hm, not sure who Vickie is, haha. Under “white rice” I wrote that I tested both, Basmati and Jasmin and both cook to perfection in the same time. I too have your info bookmarked and at the ready for reference. Thank you. My question is have you ever used the PIP method for rice and how do you feel about that? AND do you think the cook time would be the same for the PIP method? I have done it for sushi rice and I loved the texture and the cleanup was a breeze compared to putting it into the pot. Thank you for bookmarking :D I’ve never tried the PIP method but if I remember correctly someone else commented here that they did. They used my ratios in the pot and then 1 cup water in the IP pot and put the pot on the trivet and it worked. I never use PIP because I don’t feel it’s any more or less work. Using my method the rice doesn’t stick, I just remove all the rice immediately, clean out the pot with a sponge in less then a minute and that’s it. You should add a minute or two when using PIP because the cooking is slowed by the container. That makes A LOT of sense Isabelle! Thank you for the tip!! I will definitely have to try the PIP method one day. I made IP brown rice today, first time I’ve had to make it since reading your article. I’m in Ottawa, not too much above sea level, so I anticipated that your instructions wouldn’t need any tweaking. It seemed counterintuitive to use only 1 cup of water per cup of rice, but I trusted you and all the testing you did…. The rice was absolutely perfect! Not a drop of water lurking in the pot; and the rice was perfectly, splendidly, wonderfully cooked. Thank you so much for commenting and rating Shelley! You made my day!!! Just tried with store bought white rice (3 min) and it didn’t stick to the bottom but it definitely was a bit crunchy. Like I needed one more minute to cook it? I only did 1 cup which maybe isn’t enough in my 6 quart? I just finished making this recipe using Minnesota Cultivated Wild Rice. I am using it to make wild rice bread. I used 1 1/2 c. Wild Rice and 1 1/2 c. water. I am extremely happy with the results. I did 32 minutes high pressure and 18 minutes slow release. I was aiming for curled rice and I have a mixture but it is soft and will be lovely in my bread. It made roughly 3 1/2 c. Wild Rice. Thank you! 2nd recipe I have made using my Instant Pot Ultra. 1st was hard boiled eggs, also perfect and will use the wild rice bread to make grilled egg salad sandwiches. Thank you so much for sharing your experience Carol!! Sounds like you’ve got the pressure cooking down!! :D I’m so happy for you! I want to try your method with Jade/Bamboo Pearl rice. Should I use the Sushi Rice time since the rice does not have a hull on it like the brown rice? Or should I use the Black/Forbidden Pearl time since the green rice is a pearl variety? I don’t have much of it on hand so I’m nervous to just try one in case it doesn’t work. Loved the blog. Thanks! Hi Nikki, I’ve never cooked that rice before but I found a brand online (Lotus) and the package instructions say to cook it for 20 minutes so I assume you would cooke it like the sushi rice, NOT like the black rice. The sushi rice in a pot takes about 20 minutes as well. The black rice in a pot can take up to an hour. Thank You Sooo much for this!! Do you have a jambalaya recipe for the IP? No Lisa, I’m sorry. I didn’t even know what that is, haha. Had to google it. Looks really delicious. Well this was a 2-fer post for me! Rice & reheating tips. My wild rice came out beautifully per your instructions, and then I also tried using the steam function to re heat for the 1st time. Wow. Sometimes the microwave over does when I use it to reheat, nice to have another option on hand. Thank you so much for all the information! This is WONDERFUL! Thank you for all this labor. I have copied all this down and placed in a sheet protector and am keeping it in my kitchen drawer so I can fix rice in a moment without having to google cooking time. Thank you! Awesome info. Generally cook long grain white rice, but have a love/hate relationship as sometimes it’s fabulous & sometimes it’s terrible. The video from Dan explained a lot, I’m going to give the instapot a try to get it right. I am new at this. Do you cook the rice on MANUAL for 8 minutes? I’m confused. I didn’t cook any rice for 8 minutes but I cook all on Manual, yes. Do you leave the IP on or off during MR or does It matter? I leave it on. To be honest I never even thought of turning it off. I have no idea if it turns out differently with the pot off. Thank you for this! I just ruined a whole meal last week because my brown rice was crunchy but I didn’t realize it until we’d already mixed it. I used the rice button which obviously was NOT the right option. Great photo, and awesome advice. I love Uncle Ben’s Converted Rice. Is that a par=boiled rice? Anyway, I usually do it in the oven, adding butter and salt and baking for approximately 45 minutes at a 1:1.5 ratio. It comes out perfect after about 45 minutes. Just wondering how I can convert this to the IP? Or is this on your list for an additional experiment? Unfortunately, I don’t seem to be able to get parboiled rice here in Montreal. I’ve heard so much about it. If I ever get my hands on it I’ll make sure to test. May I ask why I got a 4-star rating from you? Have you tried my method and it didn’t work the way you like it? Have discovered that that is the only rice that it cooks on rice buttons the rest is all manual and you have to manually time , par boiled rice is marked on the package. Thank you!! I made white rice by your method and it turned out perfect! My pot (the ultra) has a rice button but when I used it and the amount of water specified in the instruction booklet, my rice all stuck to the bottom but was also crunchy on top. Your method turned out great. Thank you for sharing! Thanks for this post, it’s so well done! May I ask…when you say “cup”, does that mean a standard measuring cup, or the little one that comes with the IP? Thank you so much for your kind words and for appreciating my work Donna :D I refer to US Standard Cups of 236ml volume. I’m very curious there are really two different kinds of measuring cups there is the liquid glass measuring cups or the plastic ones ( which I was always taught that this was for dry ingredients only )that most of us on which one did you use ? I generally batch-cook brown basmati to use throughout the week, but have not been brave enough to make a big batch in the IP because I practice Rapid Fermentation (as presented by the Kitchen Stewardship blog), and wasn’t sure how much the cooking time would be affected by a long soak. It’s actually been a long time since I made rice in my (now-defunct) rice cooker. I think what I used to do for soaked brown rice was to cook it on the white rice setting, but I could be wrong about that. Has anyone else cooked soaked rice in the IP, and learned what adjustments (if any) to make to the timing? I soak my brown rice and then cook it in the Instant Pot using the rice setting. Soaking an hour reduces cooking time. Sorry, no help here. Have never experimented with soaked rice. Many sites say to rinse rice. This article distinguishes between imported and domestic. May I ask why I got a 4-star rating? Have you tried my method and it didn’t turn out as expected? I always saute my rice for a few minutes first before cooking. Never sticky. I do this also. I was taught this method by a woman from Afganistan. Her rice is always amazing. But I love this post and will prob start using IP to experiment! I use lundberg short grain brown rice. When cooking in my Instant pot, it always comes out very sticky. It doesn’t matter if I am usine 1 to 1 water ratio or 1 to 1.25 water ratio. I tried different cooking times and doesn’t seem to matter. I have tried rinsing and not rinsing. Any thoughts on this? Does letting the steam naturally release make a big difference. I love my instant pot, but one of the reasons I got it was to cook rice. I use Lundberg short grain, too and get individual grains. Yes, the natural pressure release is what makes all the difference. Try it!! I use Lundberg short grain brown rice as well. The first time I made it in my IP it was a sticky mess. Lady time I made it, I rinsed, used 1:1.25 cups rice to water and added about a Tbs of oil. I cooked for 18 minutes and used natural release for 8 minutes and QR afterwards. It was much better. Tiny bit sticky but acceptable. I’m going to try this posted method to see how it comes out. P.S. I cooked mine using the rice setting. Hi thanks a lot for the guidance. I was wondering about the Rice option on the Instant pot should we really skip it and go for the high pressure timings always. With the “rice button” you can only cook white rice, no other kind. It cooks it 12 minutes on low pressure. It comes out cooked and fine, I like the texture with HP and NPR better though. 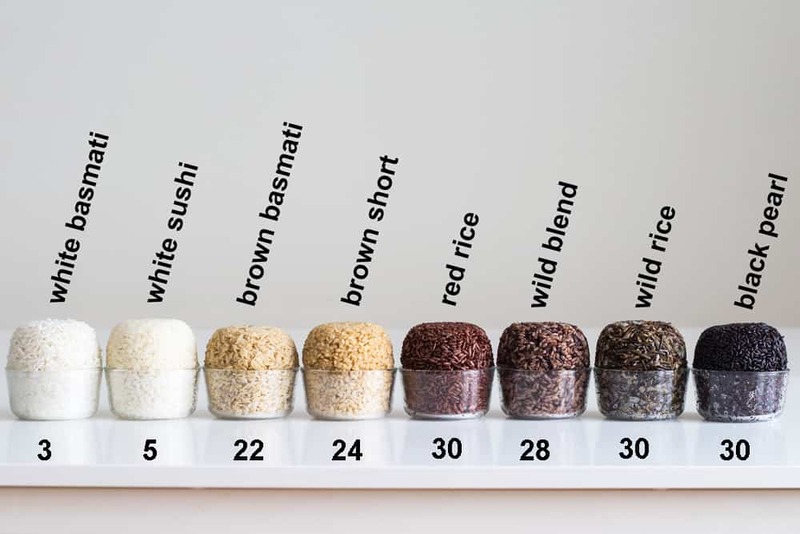 If you like the rice button version better continue cooking with that :) You can use this guide for all the other kinds of rice. Why use manual and not the automatic rice function? Is it just a matter or time? I use the auto with jasmine rice, rinsed, sometimes soaked if time allows, and no salt/oil, 1:1 water (the rice cup that comes with the IP and 3/4 cup water). It turns out good, but I’m always looking for better! :) I’ll usually load it at night with the timer function so its ready to pack for lunch. With the “rice button” you can only cook white rice, no other kind. It cooks it 12 minutes on low pressure. It comes out cooked and fine, I like the texture with HP and NPR better though. If you like the rice button version better continue cooking with that :) You can use this guide for all the other kinds of rice. If you rinse the rice reduce water a little just like you do in your version. If you use broth is it the same ratio (didn’t see it in the above info so sorry if I missed it)? Oh, good point I will add that to the recipe. It’s basicall 1:1 rice to “liquid” can be any liquid. Water, broth, herb water etc. You didn’t mention arborio rice for risotto. I often cook it on the stove top with mushrooms and sausage. Once recently with mussels. I called that dish Muscles Risotto after the mafia hitman of the same name. I make risotto in seven minutes. I double liquid to rice… come out perfectly. Thank you for putting time into this and sharing your results. I’m new to the Instant Pot and have not made rice yet but I’m planning on trying it and now you have equipped me with great info. Thanks again!! Thank you for this! I appreciate all the work and testing you did just to share this information with us. I’m usually an apprehensive cook to say the least, but this gives me confidence now! Thank you so much for appreciating my work Michelle! Thank you for all your effort! I’m at 1900 feet and your basmati times are the same as I’ve used previously. So glad to have a handy guide for all the other types of rice now! Great Crystal! Yes, anywhere under 4,000 feet should be still same times. At 4k plus feet altitude is when things start changing. Rinsing the rice removes arsenic, I’d recommend rinsing for sure. This applies to Parboiled Rice. It does replace some of the vitamins, etc that were lost in the parboiling process. But I don’t think this applies to the imported jasmine and basmati rices that many of us use. I don’t believe that imported rices contain the same additives that parboiled rice contains, but often my rinsing water is quite cloudy. I will rinse. Always rinse if that makes you feel safer. There are tons of things I do in the kitchen that make no sense to others, haha. Don’t let anybody talk you into something you are afraid of doing. Hi, I really enjoyed this page about rice. I’m italian, so I use italian rice (like Arborio or Carnaroli) 95% of times. And when I cook risotto, I always use italian rice. I found that 8 mins Manual and rice:broth ratio 1:1,5 (with QR) are perfect for me. If in the risotto there is something which release water while cooking (like frozen Porcini mushrooms), then I use less broth. So, the general rules for risotto are: first, sautée the not-rice ingredients (like onion, veggies, ham, pancetta, etc), remove everything from the pot then sautée rice for like 2 minutes with white wine. Turn the pot off. Add the broth (1:1,5), then on top of the rice put the remaining ingredients. Close the lid, set Manual for 8 minutes and QR. I hope you may find this useful. Thanks, I’m going to try your risotto recipe today! I’m sure Amy was talking about Giulia’s recipe this time. Great photos and information! I use either good ole Uncle Ben’s white rice, or Nishiki Japanese rice. I haven’t done Uncle Ben’s in the Instant Pot yet. (Have you?) The Nishiki, I have done at 1:1.5 on the rice setting (12 minutes high pressure, natural pressure release) and have been happy with it. Have to stir it and it does get a little closer to sticking to the pan. I’ll try 1:1 next time and a shorter cooking time…see what happens. How about arborio rice for risotto? Thanks for the time and effort you have put into this project! Thank you for for this it is very helpful indeed, I’m just curious to know why you don’t use the rice button. Thank you for all this information, it is fabulous! Can I please ask you what the cooking time would be for plain white long grain rice? Would it also be three minutes followed by the natural pressure release? I’m still learning my way around my instant pot and I really appreciate the time and effort you put I to explaining this. I’m definitely going to save this post and pass it on. Thanks!! Thank you for appreciating my work Laura!!! What an amazing experiment you did! So very impressive and so very helpful. And your photos are artistic and helpful! Thank you so much!! I think you should take up a collection so that everybody that appreciates what you’re doing could pay to send you around the world to test it all LOL. I do have one other type of rice I make and I thought I would add it to your list for you. Coming from Hawaii we use calrose rice to make “Sticky Kine” and I have got the perfect recipe for cooking it after massive experimentation. I use the little standard rice cup to measure the rice. Then for every little rice cup I use one real cup of water. You could use one and a half rice cups of rice and one and a half cups of water or 4 rice cups of rice and 4 cups of water etc. Push the rice button which will cook at low pressure for 12 minutes. Then let it natural release for 6 minutes followed by opening the vent, and then open the lid and and you will have perfect sticky kine rice. Thank you for adding this! Calrose is my family’s favorite rice! There are many different kinds of rice used to make sushi in Japan, so the term “sushi rice” is actually a pretty broad description, and to some people, it includes Calrose rice. “There is a variety of rice called Calrose, which was developed in 1948 and is a medium grain rice which has been grown by Japanese American producers in California for many years. While not a true Japanese rice, it is commonly used to prepare Japanese cuisine in North America and is a reasonably good to use for sushi.” (allaboutsushiguide.com) So perhaps both kinds offer similar results for the same IP cooking method! Sorry, I’m not familiar with the different kinds of Sushi rice. I had to draw the line at some point with rice. I chose the Lundberg Brand labeled “Sushi Rice”. I have no idea what kind exactly that is however. Thank you for sharing. I grew up in Hawaii eating the same rice. I only have Nishiki instead of calrose on hand, but wanted to make sure my rice was cooked the way we like it back home. Since they are both short grain rice I will cook it the way you mentioned. I just saw the post above regarding calrose being medium grain. Thank you for sharing. A big thank you to the author for this article. You Rock! Thank you so much for your lovely comment April!! I’m happy you found the other comments helpful! First, a great big thank you for the vast amount of the time you invested in making cooking rice easier for all of us. Now for my question. Do the ratio and cooking times also apply for cooking PIP? You are very welcome :D I’ve never cooked anything PIP so unfortunately I don’t know. If you try please let me know. I will put this test on my list, too and hope I can get to it any time soon. I’ve heard from several now that pot in pot works the same. Haven’t tried myself however. It’s me again. Have you played around with sweet rice and brown sweet rice? Also, is plain long grain the same as “white rice” on cooking instructions? No, I’ve never tried sweet rice. Sorry. And I’m pretty certain most white rices cook in 3-5 minutes. The thinner ones in 3 the thicker ones in 5. So this is manual setting and high pressure, right? And, how many minutes would you add for 2K feet elevation? BTW, thanks for the terrific article, I got rid of all my stove top pressure cookers and now I want to find a new home for two rice cookers! AKA downsizing. Yes, “manual” is “pressure cook” in some of the newer models. For 2,000 feet I wouldn’t add anything to be honest. It’s still pretty low. Mayyybe 1 minute. Thank you, thank you! I’m saving this. Great questions above too. In addition to those, I’d also like to know what size Instant Pot you’re using. Thanks! You are very welcome. I use a 6 quart. I have a 3 qt and an 8 qt Instant Pot. Will your tips on all rice types still work in either one??? Hi Carmen, yes all tips apply. The only thing you have to pay attention to is the minimum liquid requirements. I believe the 8 qt calls for a minimum of 2 cups liquid to come to pressure so you’d have to cook 2 cups of rice with 2 cups water at least. It won’t work with just 1 cup. The ratios stay the same though one:one. I’m wondering if I can cook glutinous rice (sweet rice) the way water ratio and how long should I be cooking it? Thanks in advance! How long do you usually cook it and how? Or what does the package instructions say? What is the case cookinh time for long grain rice? White you mean? I’d have to test. I had to draw the line at some point but I’m hoping to add more varieties over time. I just did 22 minutes for long grain brown and it turned out fine. Thank you so much for this. All your effort is greatly appreciated. I’m excited to use this reference! Thank you so much. Excellent information! Thanks! Do you cook the rice and water in the inner pot or do you place another container on the trivet to cook it? I always cook everything directly in the inner pot of the Instant Pot. I’ve never tried the pot in pot method. Hi Laura, you are very welcome. I use the “manual” button (in some Instant Pots that’s the “pressure cook” button) and adjust timing and make sure the “high pressure” light is on. I use a US Standard measuring cup. 236ml in volume. 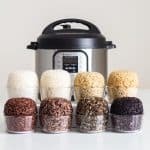 It doesn’t really matter what container you use simply use the same container for rice and water to make sure you are using a 1:1 ratio plus make sure you use the minimum volume required by instruction manual of your Instant Pot model. If you pot says 2 cups liquid minimum you need to make at least 2 cups rice with 2 cups water. My assumption is that if it is one to one it wouldn’t matter the measuring devise. I use US Standard American. It’s 236ml in volume. It doesn’t really matter though. The important thing is that you use the same ratio. Whatever container you use, fill with rice and then fill with water to the same level. Also, make sure you add the minimum amount of volume per instruction manual of your pot model. Awesome post! I’ve yet to master rice in the IP. I’ve been cooking with a sprouted blonde rice by Planet Rice. I think it’s somewhere between white and brown so I’ll have to play w the timing on that. Yes, play around. Usually sprouted cooks faster than unsprouted so maybe something in between. What does the package instruction say in terms of timing? Are you rinsing the white rice? I read for IP rice to rinse it for 2 minutes first. I would like to know this also, actually shouldn’t you rinse all types of rice. I always rinse my rice. I never rinse rice. In my opinion rinsing rice is a matter of personal preference in terms of texture. Rinsing removes starch and thus the consistency changes. It’s not a matter of hygiene. #1 rices in North America are all pre-washed and re-dried before packaging and on top you’re boiling your rice so all bacteria should basically die during that process. When I rinse my rice, a lot of “dust” is removed. I can’t imagine consuming that debris, whatever it is. I’m in California and get my rice at TJs or Whole Foods. The dust is essentially rice starch from the grains rubbing together. At the very bottom of the article she says she never rinses the rice. It goes into the pot dry, dry, dry. I don’t rinse it. I never rinse my rice regardless of the cooking device. I like the texture of rice better when adding it dry dry dry to the pot/instant pot/rice cooker. I’m at 2,350 altitude. Can you please provide adjustments. Do you have a quinoa recipe? Great info! I haven’t cooked rice yet; however, will now give it a try! The instructions on my ULTRA 60 states a 2 cup liquid MINIMUM is required. Do you have a different IP? Yes, I have 6 qt 7-in-1. If yours states 2 cups minimum use 2 cups. The ratio is still 1:1 so basically 2 cups rice to 2 cups water.